With a 4-1 win, the Washington Nationals earned their season a temporary stay of execution. 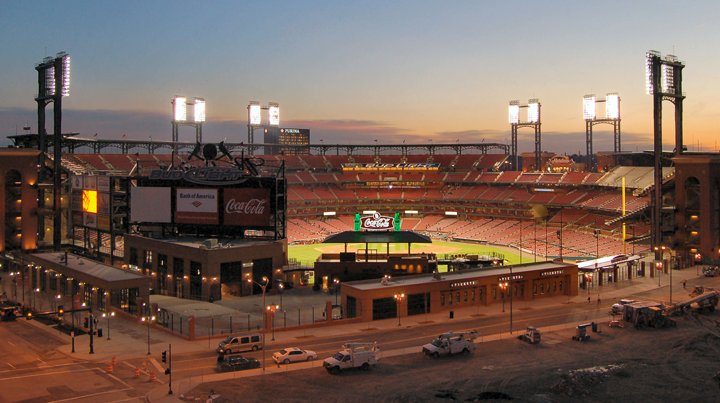 Meanwhile, the St. Louis Cardinals are one win away from upsetting the Los Angeles Dodgers. With both NLDS at 2-1, each game played from here on out will be a meaningful one—one that will have a significant impact on everyone's World Series chances. With the Dodgers' loss, the odds of the Baltimore Orioles and Kansas City Royals winning the World Series ticked up slightly hire as one of their strongest NL competitors was pushed to the brink of elimination. On the other hand, the Nationals' win pushed their World Series odds back from 19-1 to a slightly more impressive 9-1. The Giants are still in the proverbial driver's seat. 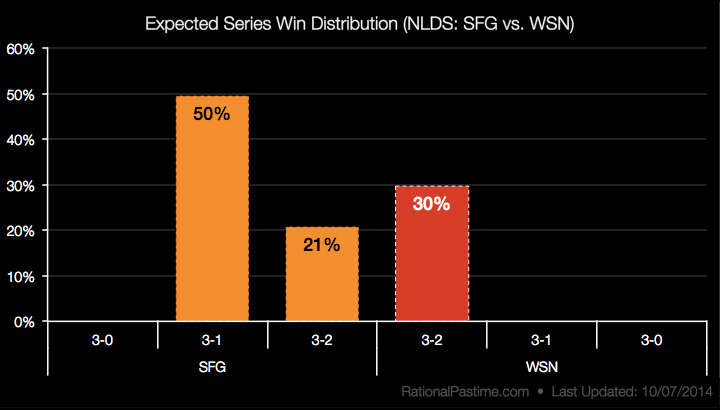 Remember: the Nats need to win out to advance—a 30% probability—while San Francisco only needs one more game. 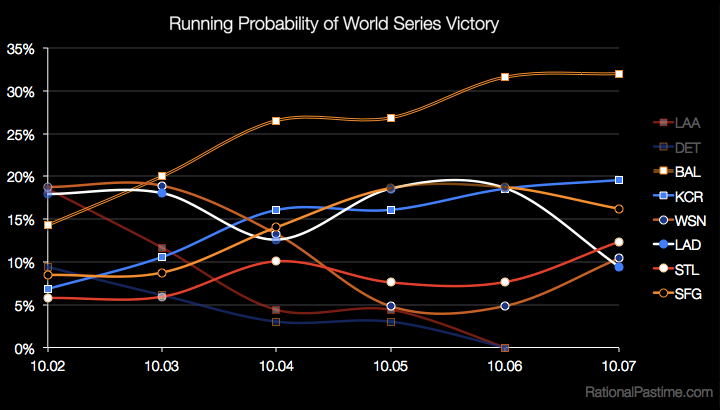 Rational Pastime's model still puts the Giants at 50% to finish the job tonight and 70% to advance. If Washington forces a fifth game back home, however, the advantage swings back to DC. 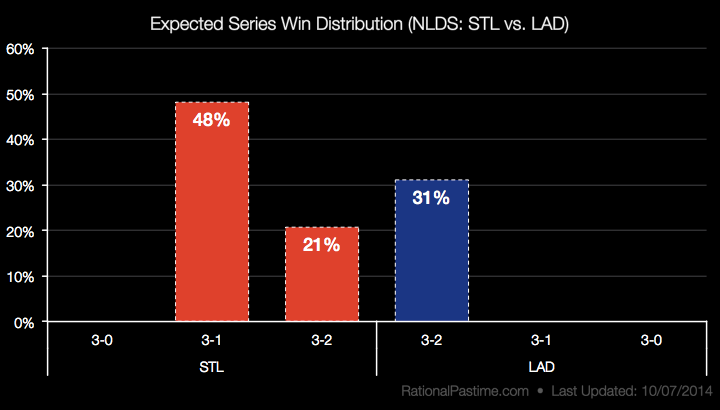 Once again, the probability distributions of the two NLDS nearly mirror one another. Both the Cardinals and the Giants are weaker competitors up a game in their series and require only one more win to advance to the next round. An Orioles win over San Francisco in Baltimore remains the most likely World Series result. The possibility of a Battle of the Beltways ticked back up to 11% with the Nationals' return to respectability. A Show Me State showdown remains a distinct possibility, as do rematches of the 1966 or 1944 World Series. 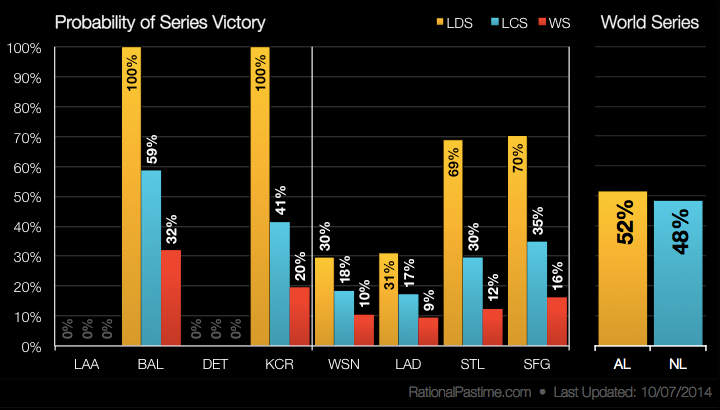 Stop by tomorrow for updated ratings, probabilities and charts following a pair of possibly decisive NLDS match-ups.